It’s the most wonderful time of the year, and taking TriMet is a great way to travel to many holiday festivities. While not one-horse open sleighs, our buses and MAX trains do offer a convenient ride to a bevy of events throughout the area. Plan ahead and use TriMet’s online trip planner to make your way to one or more of the following events this holiday season. A number of communities are kicking off the holiday season with traditional tree lighting ceremonies, and they’re just a bus or train ride away. 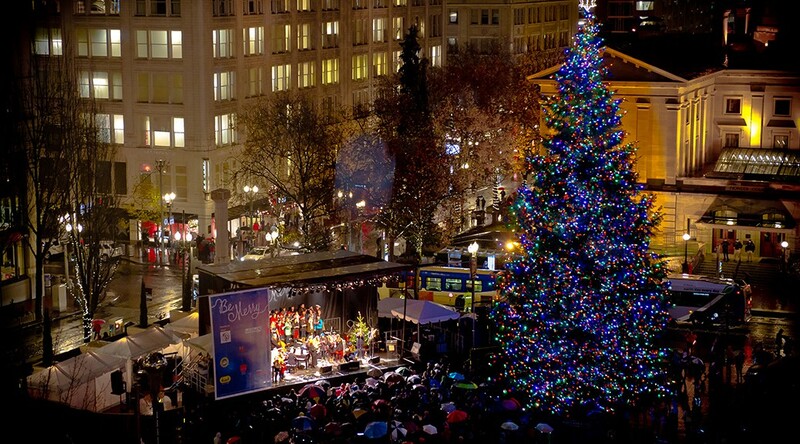 Join thousands of Portlanders Friday, Nov. 24 at Pioneer Courthouse Square to enjoy Portland’s holiday tree lighting. The ceremony starts at 5:30 p.m. and includes a holiday sing-a-long. All MAX lines and at least 15 bus lines serve the area. All 6th Ave bus lines (1, 4, 8, 9, 12, 16, 17, 19, 35, 36, 43, 44, 54, 56, 94 and 99) will not serve stops between Salmon and Washington. Buses will detour via 4th from 5:30 p.m. until about 7:00 p.m., or when the crowds disperse. The 26th annual Spirit of Christmas rings in the holiday season on Saturday, Nov. 25 with a free, family-friendly program that includes live music, hot cocoa, photos with Santa and the tree lighting on the Arts Plaza. Festivities begin at 10:00 a.m. with the tree lighting taking place at 6:00 p.m.
How to get there: Take bus lines 9 or 80 to the NE Hood and NE 2nd stop. Come to Liberty Park for the annual tree lighting Friday, Dec. 1 at 6:45 p.m. Afterwards, join Santa and Mrs. Claus at the Ballroom Dance Company nearby for hot cocoa, cookies, kids crafts, photos and more. How to get there: Take bus lines 12, 76, 78 or 94 to the SW Main and Scoffins or SW Main and Pacific Highway stops. On Saturday, Dec. 2, the city hosts their annual tree lighting ceremony at Beaverton City Library & City Park. The ceremony starts at 6:00 p.m., but make sure to come earlier in the day to enjoy the German Holiday Market and Holiday Open House for a chance to meet Santa and Mrs. Claus. For even more holiday cheer, the Beaverton Civic Theatre presents Annie in the Beaverton Library Auditorium at 7:30 p.m.
How to get there: Take bus lines 76 or 78 to the SW Watson and 5th or SW Hall and 5th stops. You can also take MAX Blue Line to Beaverton Central, then walk south on Hall to the library. The City of Milwaukie’s holiday tradition of decorating umbrellas and parading through downtown, ending with a tree lighting at city hall, takes place Saturday, Dec. 2. How to get there: Take bus lines 32, 33 or 70 to the SE Jackson and 21st stop located behind city hall. You can also take MAX Orange Line to the Milwaukie/Main St MAX Station, then walk north on 21st Ave to city hall. There are a number of other festive activities to enjoy this holiday season. 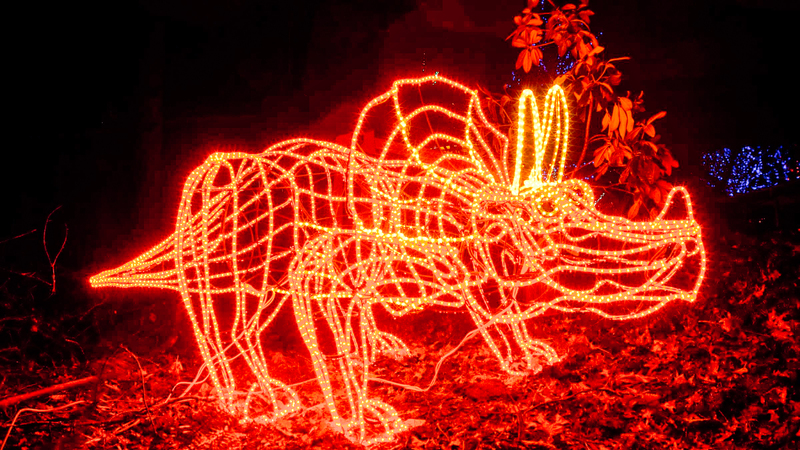 The Oregon Zoo flips on the switch for their annual winter festival, ZooLights, starting Friday, Nov. 24 at 5:00 p.m. Hop on MAX Blue or Red Line and head over to enjoy the dazzling display of more than a million and half lights. 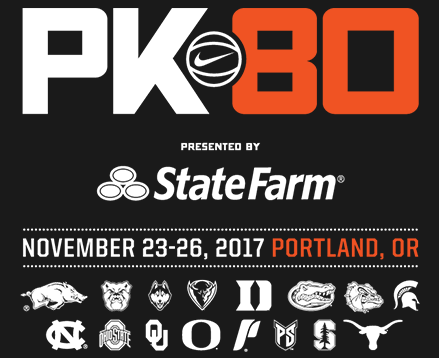 The event runs through January 7, 2018. The Sunset Transit Center Park & Ride is a popular stop for ZooLight goers, but keep in mind it can fill up quickly on busy nights, especially when the Trail Blazers have home games. Consider other parking options, such as Millikan Way or Beaverton Creek’s Park & Rides, which are only a 15 minute MAX ride away. Remember to show your fare at the ticket office to receive either $1.50 or $5.00 off admission depending on what day you go! See the ZooLights schedule for details. Come on out to Hillsboro for the return of Winter Village at Jerry Willey Park at Orenco Station. This yearly holiday tradition features the only open-air ice skating rink in the area, as well as carolers, shopping, activities for the kids and more. Jerry Willey Park is just steps away from the Orenco MAX Station, making it easy to get your family to and from the annual event. Just catch the MAX Blue Line and head to Orenco. Other Christmas parades have floats, but in the Pacific Northwest we get ships. The Christmas Ship Parade has set the Columbia and Willamette Rivers aglow for more than 60 years, and the annual event sets sail once again December 1. With a number of viewing areas accessible by transit, use TriMet’s online trip planner to plan your outing. Since the 1920’s, each house in this neighborhood has been decorated for Christmas. Take a stroll down Peacock Lane and enjoy an array of beautiful lights, nativity scenes, rotating Christmas trees and more Dec. 15 – 31 from 6:00 p.m. to 11:00 p.m. Pedestrian only days are on Dec. 15, 16 and 17. This is a very popular destination, and parking is very limited. Bus Lines 15, 66 and 75 drop you within walking distance of this Portland tradition. There’s so many events to enjoy this holiday season. For more info on holiday festivities around the area click here. All MAX lines, and at least eight bus lines, serve the Rose Quarter area. The MAX Blue, Green and Red lines stop at the Rose Quarter Transit Center, and the MAX Orange/Yellow Line serves the Interstate/Rose Quarter Station. Both are steps from the Moda Center and coliseum entrances. It’s important to remember that on Thanksgiving, Thursday, Nov. 23, buses and MAX will operate on reduced Sunday schedules for the holiday, so plan ahead by visiting trimet.org for trip planning and arrival times. Be merry. Be alert. Be safe. Remember when crossing tracks and streets to be aware and be safe. Take a moment to stop, pause your devices, and look both ways before crossing. Also, make sure an umbrella, hood or other clothing doesn’t block your view of approaching trains, buses or autos. Large crowds are expected at these events. Whether you’re on the TriMet system, or enjoying the festivities, be aware of your surroundings. If you see something suspicious, say something. If on TriMet, alert an employee or security officer, or call 9-1-1. If you cannot make a voice call, text 9-1-1. Be safe, have a great time and happy holidays from TriMet.